When would I want to send a package by e-mail, IM, or Web? * E-mail – Send your latest photos, videos or other large files direct to your friends as often as you like without ever clogging up their inbox! E-mailing files and folders is as easy as this. * IM – So you’re explaining the minutiae of your PowerPoint presentation over instant messenger and your partner hasn’t a clue what you’re talking about. Use Pando to generate a link to your file, and paste it right into your IM conversation—no matter which messaging software you use. “How?” you ask. Click here. * Web – Got an awesome web site or blog? Share your files on the Web or post those videos directly to your blog. Pando generates neat-o Flash widgets, MySpace widgets or plain ol’ URL links. Just copy and paste. See how to do it here. And ’tis just as nice to send as to receive. 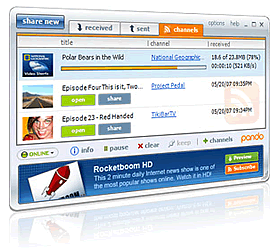 Have you checked out Pando Channels with new hi-res videos and audio shows?